Lake Pend Oreille (pronunciation: /pɒndəˈreɪ/) in the northern Idaho Panhandle is the largest lake in the U.S. state of Idaho and the 38th-largest lake by area in the United States, with a surface area of 148 square miles (380 km2). It is 43 miles (69 kilometers) long, and 1,150 feet (350 meters) deep in some regions, making it the fifth-deepest in the nation. It is fed by the Clark Fork River and the Pack River, and drains via the Pend Oreille River. 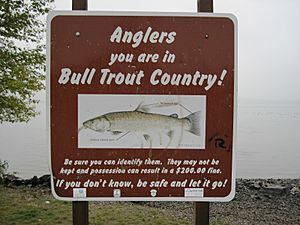 It is surrounded by national forests and a few small towns, with the largest population on the lake at Sandpoint. The majority of the shoreline is non-populated. All but the southern tip of the lake is in Bonner County. 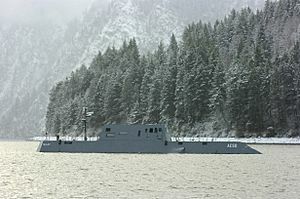 The southern tip is in Kootenai County and is home to Farragut State Park, formerly the Farragut Naval Training Station during World War II of which a small part is still active and conducts US Navy acoustic underwater submarine research. Lake Pend Oreille was glacially formed during the ice age. It is also believed that the eastern side of the lake was in the path of the ancient Missoula Flood. The lake sits at the south end of the Purcell Trench, carved by glaciers moving south from Canada. The eastern side of the glacier is believed to have formed the dam for the Missoula flood, at the point where the Clark Fork river enters the lake between the Cabinet and Bitterroot mountains. The lake is made slightly larger by the dam at Albeni Falls, just east of Oldtown, Idaho. The dam is 90 feet (27 m) high and operated by the Army Corp of Engineers. Along with Crater Lake, Lake Tahoe, Lake Chelan, and Lake Superior, it ranks as one of the five deepest lakes in the United States. The area around the lake is the traditional home of the Kalispel Indian peoples. 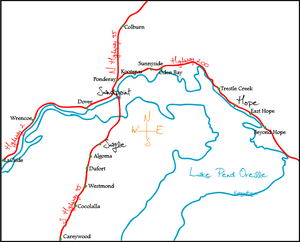 David Thompson established a North West Company trading post on the lake in 1809. A Canadian fur trader in Thompson's party is believed to have given the lake its name. The words "Pend Oreille" are French for an ear-hanging or pendant. Ear pendants were characteristic of the Kalispel tribe. The lake is shaped much like a human ear when viewed from above or on a map. During World War II, the south end was the second largest naval training ground in the world. Built as a result of the Japanese attack on Pearl Harbor, the training station is now Farragut State Park. The lake is still used by the Navy's Acoustic Research Detachment to test large-scale submarine prototypes: the significant depth gives acoustic properties similar to the open ocean. The lake is viewed from the Pend Oreille Scenic Byway, State Highway 200 along the north shore. Much of the shore is mountainous. The mountains to the east are the Green Monarchs; to the north are the Cabinet Mountains; to the southwest the Coeur d'Alene Mountains; and to northwest are the Selkirk Mountains. Bonner County Public Works oversees Eurasian Milfoil treatment in Lake Pend Oreille. A group of Sandpoint moms, Mothers for Safe Water is concerned about this use of herbicides to treat milfoil. Lake Pend Oreille Facts for Kids. Kiddle Encyclopedia.